One of the oldest outdoor velodromes reopened on Tuesday. More than 230 concrete panels that make up the track at Carmarthen Park in Carmarthenshire have been replaced as part of a £600,000 renovation project. It is hoped the facility will increase interest in cycling and bring high class racing to the area. 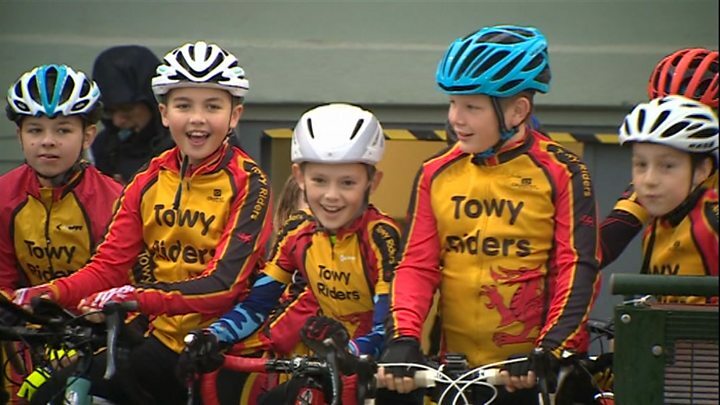 Local cycling club, Towy Riders, were given the first opportunity to ride on the track. The opening ceremony took place with penny farthings and other vintage bicycles on show. The project was funded by Carmarthenshire council, Sport Wales and Carmarthen Town Council which will manage the track. Tywi Riders coach Emyr Griffiths said he was impressed with the new facilities. "I've ridden on a similar velodrome in Roubaix... I think it's as good if not better," he said. "This was Tywi Riders' hub...we've been away from this location for a while and we're looking forward to coming back." Welsh Cycling development officer Aled Jones said the new track has been sandblasted to provide more grip. "Concrete velodromes tend to be quicker than tarmac," he said. Carmarthenshire council leader Emlyn Dole said the redevelopment of the velodrome was part of a wider strategy to make Carmarthenshire a major centre for cycling. He said plans were in the pipeline for a closed road circuit track at Pembrey and a cycle path for the Tywi valley.